"A garden is a thing of beauty and a job forever"
Well-kept parks are welcoming parks. With its wide range of dedicated green care attachments, the Nilfisk Outdoor Ranger can keep things neat and tidy in parks and gardens as well as amusement parks and camping sites. The wonderful smell of green trees, plants and lawns is a joy for everyone, but keeping parks beautiful and well-maintained is hard work. Whether it’s mowing, edge cutting, verticutting, hedge trimming, or leaf suction, it seems like there’s always more to do. 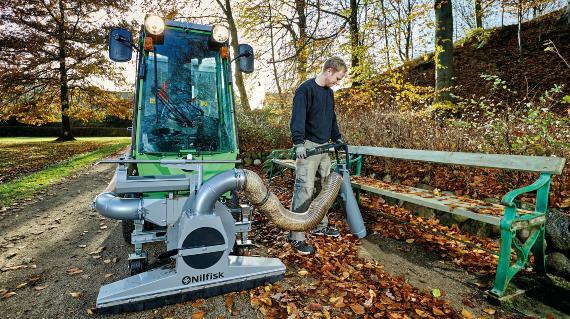 Nilfisk Outdoor utility machines easily switch from one task to another with their tailor-made green care attachments. Choose a version without a cabin to easily jump on and off the machine and enjoy the smell of green during work. A compact and maneuverable utility machine makes life easier for a gardener. Nilfisk has designed a whole range of attachments to assist gardeners with tough jobs – like our tipping shovel, which helps with heavy lifting, and our hydraulic hedge trimmer to spare the gardener’s shoulders. 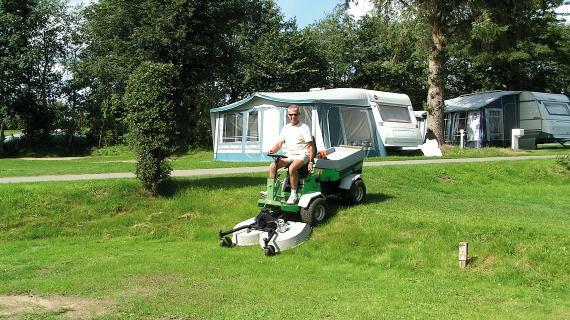 With a Nilfisk Park Ranger Riding lawn mower, it´s a pleasure cutting the grass - even around obstacles like trees and flowerbeds and under bushes. 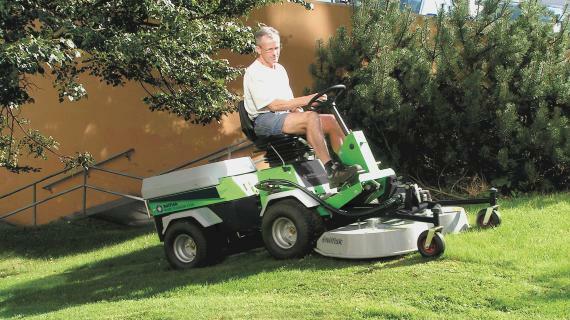 Because it’s so lightweight, the Park Ranger 2150 leaves no tracks on the lawn. Nobody likes weeds, but it’s not an easy choice to use pesticides to eliminate them in gardens and parks. Nilfisk Outdoor Rangers provide you with several solutions for non-toxic weed control. Our verticutter for non-toxic lawn care removes weeds and moss from lawns without pesticides. And the Nilfisk Outdoor Rangers can be fitted with a weed brush for non-toxic weed control on pavements, paths, flagstones, and asphalt. Our environmental rake keeps gravel roads weed-free without pesticides. A day at an amusement park should be fun for the whole family, and the cleanliness of the park helps create a high-quality experience. Litter on pathways between the attractions is never a good look, and green areas and gardens must always be tidy and welcoming. With a Nilfisk Outdoor Ranger, it’s easy to keep your facility looking its best. 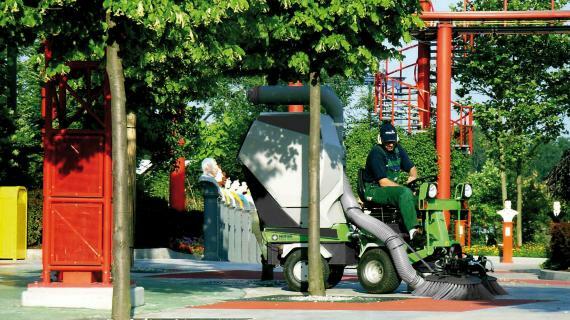 Our suction sweeper keeps the park clean, and the green care attachments maintain gardens professionally. Maneuverability and flexibility are key words when it comes to keeping an amusement park clean. 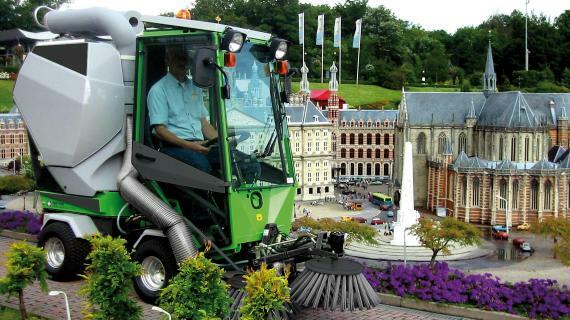 The compact design and articulated steering of the Nilfisk Outdoor Ranger make it the perfect machine to remove litter and dirt from around attractions, working on the narrowest paths. Our wander hose is ideal for cleaning hard-to-reach places like behind benches, around waste bins, and on stairs. The third side brush is optimal for sweeping right up to buildings and under benches. No area of the park will go neglected, and all the work can be done quickly and efficiently. Many camping sites cover hundreds of square meters of grass, and campers expect every part of it to look good. 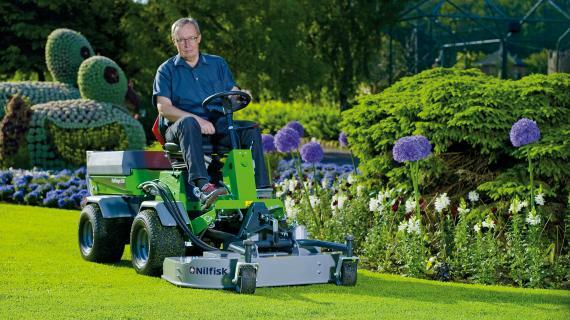 With the maneuverable Nilfisk Park Ranger, you can optimize your grass cutting. The Park Ranger turns on a plate, cuts grass in no time, and even works on hilly terrain. For rough grass areas, you’ll be impressed by the performance of the flail mower. And the Park Ranger’s hedge trimmer spares your gardeners’ shoulders and cuts hedges effectively. All you need is one utility machine for all these attachments. If heavy rain has damaged the sand and gravel pathways of your camping site, it takes only a few minutes to shift to a tipping shovel - and now your Park Ranger is ready for levelling the paths. Does a guest need assistance placing his big caravan? Offer the service to tow it in place with your Nilfisk Park Ranger. Want your camping site to be eco-friendly? Remove weeds on gravel paths without the use of pesticides, using attachments to your Park Ranger. The Nilfisk Park Ranger gives you the flexibility to react. Get versatility for efficient city cleaning all year round! 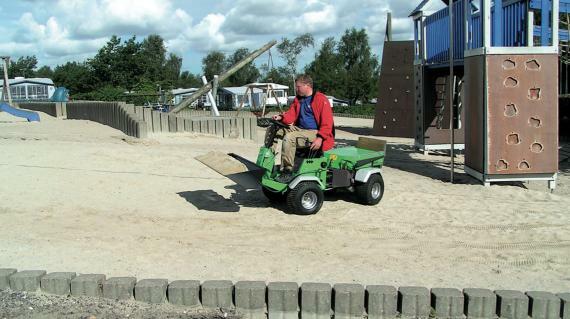 All year round power and versatility for park maintenance!